The United States military faces uncertainty on several fronts in the upcoming years. How deep will we get into Syria? Will deployments to Iraq surge to former levels? Will the U.S. ever complete the mission in Afghanistan? In what ways will Russian aggression and Chinese expansionism shape training? How significant a role will cyber warfare play in future conflicts? American military leaders, especially junior leaders, must be prepared to confront these uncertainties; to do so, below are three broad areas critical to military leadership of the future. There is a reason the military puts little energy behind controlling the kind of bachelor’s degree its newly minted officers earn. The point is that these officers develop moral character, time management, and critical thinking skills (among other things) in the process. I personally know a junior Military Police officer with a music degree—she is one of the best junior officers I know, recently winning the General MacArthur Leadership Award nomination for her command. While the military certainly needs service members trained in highly technical fields, a leader is a leader, specialty immaterial. When I completed command, I stepped out of a narrow lane of administration and protocol and into a multi-lane freeway of discipline, training, planning, accountability, maintenance, property, and, yes, administration and protocol. I learned more in those 15 months than the rest of my career. I was a fan, in theory, of the Army’s short-lived Basic Officer Leaders Course experiment in which, from 2006-2009, new second lieutenants of all specialties came together to train on basic skills before being sent off to their job-specific schoolhouses. It made sense logistically and administratively to nix that system, but it was replete with the urgency and emphasis of putting leadership before specialization. In the absence of such a systemic tool like the Leaders Course, the military at large must continue to emphasize the importance of developing leaders who are flexible and mentally agile enough to lead outside of their narrow specialty niches. The Department of Defense can do so by reassessing its talent management process and encouraging leadership assignments for all leaders who demonstrate the potential for success in such roles, regardless of their specialization. As it exists today, the DoD’s personnel and talent management methods aren’t capable of such action, and they need reform. A topic of many military blogs and the subject of numerous articles, the U.S. military’s talent management system is fraught with imperfection, especially its maligned “up-or-out” policy in which leaders are forced out of the military if they are not selected for promotion. Some speculate that the Pentagon’s failure to update its antiquated personnel management system is resulting in a “brain drain” in which the military’s most talented leaders are fleeing the service for more lucrative civilian sector employment that offers better professional opportunities. A close friend made an excellent point when he lamented the repetition of the “brain drain” line. He derides the idea that the best and brightest are separating at ever increasing rates while the rest are mindless time-clock punchers who cannot think critically or write well and are counting down the days to the 20-year mark. I tend to agree that the overall problem is probably somewhat exaggerated with the help of oft-repeated anecdotes (like those in the cited Atlantic article). There is certainly, however, a very real need to address talent management as it exists today. For example, as Colonel Brett Sylvia, current commander of the 2nd Brigade Combat Team “Strike,” 101st Airborne Division (Air Assault) wrote in 2014, the U.S. Army has the talent and institutional knowledge it needs within its ranks, but its personnel management rigidity and lack of existing capabilities to take advantage of those talents prevents it from maximizing its human capital. Looking at “up or out,” many reform options exist, including a suggestion to reshape the Warrant Officer Corps to allow those who failed to promote to continue serving. It is no secret that some officers resign their commissions to serve as warrant officers, particularly pilots who wish to continue flying. There are even instances when officers resign to serve as NCOs. The Department of Defense should redevelop Selective Continuation in a way that allows continued employment for those with the ability, motivation, and desire to continue serving provided they possess the skills, experience, and institutional knowledge the military needs. This may be an oversimplification, but it gets to the heart of doing what is best for the military while still doing right by the common servicemember. These ideas are in the clouds for most junior military leaders, however. It is up to leaders at lower levels to shape the military’s junior talent. The cornerstone of accomplishing this is through honest and constructive feedback via regular counseling and un-inflated evaluations. If a leader is a dud, his boss owes it to him to tell him so, tempered of course by adequate expectations laid out in initial counseling and with opportunity to fail, learn, and improve. On the other hand, if a leader is not a dud, her boss should tell her so as well through accurate, useful, and true assessment. Talent management starts at the lowest level. For these reasons, honesty and integrity will continue to be cornerstone characteristics for military leaders. Junior leaders who are honest with themselves and their subordinates, led by senior leaders who demand integrity, will shape future military talent. How do troops operate as the first force in an immature theater unsupported by a system of bases? What do they do when the networks and electronic devices that form the backbone of modern warfare suddenly stop working? When networks fail? When lights go out and they are left with whiteboards and maps? Can the military succeed in an austere environment under analog conditions? Of course it can, but who actually trains that way and pulls the plugs in the field? It is certainly a worthwhile exercise for all unit staffs. General Mark A. Milley, U.S. Army Chief of Staff, spoke recently about the importance of readiness in the face of an increasingly aggressive Russia and a modernizing Chinese military. Former Secretary of Defense Robert M. Gates shared these outlooks throughout his time at the Pentagon, later writing of “our need to prepare for future potential large-scale conflicts against other modern military powers.” These observations, combined with the proliferation of cyber offensive capabilities and China’s expanding anti-access/area denial strategy, paint the picture of a global operating environment that demands a return to basics from the U.S. fighting force. To look at readiness from a different perspective, in late 2014, military units were ordered to Liberia in response to the Ebola virus outbreak in support of Operation United Assistance (OUA). Troops who would have easily been cleared to deploy to Afghanistan were flatly declared non-deployable to Africa for medical reasons. Those organizations learned the hard way that Africa Command’s medical requirements were stricter than those of Central Command’s. The 101st Airborne Division (Air Assault) “Lessons and Best Practices” for its OUA deployment briefly mentions how its readiness processing identified non-deployable personnel, but it focuses primarily on how the division command sergeant major was able to overcome the resulting non-commissioned officer shortage. The more critical lesson, however, is that the different requirements initially caught leaders off guard and shed light on a whole new group of service members who could not deploy to an austere operating environment, but who might otherwise be considered “available.” This builds on top of concerns like those of Sergeant Major of the Army Daniel A. Dailey, who declared non-deployable soldiers as the biggest problem in the Army today. The fight of tomorrow may well be in immature, austere theaters of combat, perhaps hindered technologically by enemy cyber offensive attacks. Contemporary and future military leaders should adopt a mindset rejecting the assumption that technological platforms are held constant. Without overly detracting from existing essential training, leaders can prepare for such operating environments by occasionally denying these capabilities to their organizations and forcing them to critically solve the ensuing analog challenges in a training environment. Failure to do so will at least initially disadvantage future military forces if faced with an enemy equipped with the means to blunt the U.S. technological edge. Military leaders must also exercise honest and ruthless scrutiny with regard to troop readiness. The military has no choice but to rely on the service members it has, and leaders cannot shy away from enforcing the strict standards that ensure maximum availability and readiness. That may mean commanders separating troops who fail to meet the standards. As then-Secretary of Defense Donald Rumsfeld famously said, “You go to war with the army you have and not the army you might want or wish you had at a later time.” Military leaders now and in the future must unapologetically forge the military we have into the best prepared force possible. The only certainty about the future of the military is uncertainty; to paraphrase the headline for a piece Micah Zenko wrote in 2012, the U.S. military is “100% right 0% of the time.” Even so, there are at least three broad areas that military leaders should key in on: the specialty-immaterial development of military leaders, the need for DoD-wide talent management reform, and the threat of conflict in an austere operating environment under analog conditions. Not surprisingly, many of the leadership characteristics the military extolls today are needed going into the future. Now more than ever, leaders must possess flexibility, mental agility, honesty, integrity, and be capable of rejecting assumptions by getting “back to basics” and ruthlessly scrutinizing readiness. America demands that its military leaders be ready for any fight it is sent into, able to tackle all of the uncertainties that entails, and the military owes it to the nation to train and employ leaders its sons and daughters deserve. Johnathon Parker is an Adjutant General Corps officer in the United States Army and a Master of Public Policy candidate at the Goldman School of Public Policy, University of California, Berkeley. He writes about military culture and leadership on his blog, Bourbon & Battles. Header image courtesy of Virginia Commonwealth University's Department of Military Science & Leadership. 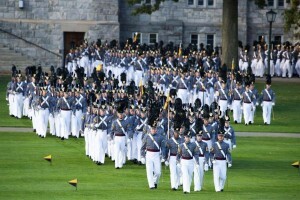 "The West Point Mission," About West Point. http://www.usma.edu/about/sitepages/mission.aspx; “Mission,” U.S. Army Cadet Command Home Page. http://www.cadetcommand.army.mil/; “Mission,” U.S. Army Officer Candidate School Home Page. http://www.benning.army.mil/infantry/199th/ocs/. U.S. Army, Leader Development, FM 6-22 (Washington, D.C.: Government Printing Office, 2015), 5-1, http://armypubs.army.mil/doctrine/DR_pubs/dr_a/pdf/fm6_22.pdf. Jeff Crawley, “Army changes structure of Basic Officer Leadership Course,” The Official Home Page of the United States Army (February 11, 2010), http://www.army.mil/article/34291/army-changes-structure-of-basic-officer-leadership-course/. A good sampling of the writing concerning military talent management includes: “A Tale of Two Majors” by Cory Wallace, http://warontherocks.com/2016/01/a-tale-of-two-majors-talent-management-and-army-officer-promotions/); “The Military Needs to Overhaul its Personnel Management Practices” by Matthew Gjertsen (http://taskandpurpose.com/military-needs-overhaul-personnel-management-practices/); “#Talent: People Aren’t Widgets: A Better Way for the Army to Manage People” by Nathan K. Finney (https://medium.com/the-bridge/people-arent-widgets-11b5448ee610#.gvjjj9lv3); “#Talent: An Obligation to those that Serve: Criticisms of Talent Management” by John Childress (https://medium.com/the-bridge/an-obligation-to-those-that-serve-9b495315843d#.c5m8gqfaf); “The Pentagon’s Pricey Culture of Mediocrity” by Dan Grazier (http://otherwords.org/the-pentagons-pricey-culture-of-mediocrity/); and “Can the U.S. Military Halt its Brain Drain?” By David Barno and Nora Bensahel. Brett Sylvia, “Operationally Effective Talent Management,” The Bridge (October 28, 2014), https://medium.com/the-bridge/operationally-effective-talent-management-6415ceefe6a4#.sa6rstupr. Chuck Holmes, “From Army Officer to NCO: Why Some Officers Resign and Become NCOs,” Part-Time-Commander.com, http://www.part-time-commander.com/from-army-officer-to-nco-why-some-officers-resign-and-become-ncos/. “Selective Continuation,” DOPMA/ROPMA Policy Reference Tool, RAND Corporation, http://dopma-ropma.rand.org/selective-continuation.html. For further discussion on developing rival technologies designed to counter US military technologies, see David E. Johnson, “The Challenges of the ‘Now’ and Their Implications for the U.S. Army,” (Santa Monica, CA: RAND Corporation, 2016), http://www.rand.org/pubs/perspectives/PE184.html. C. Todd Lopez, “Milley assesses ‘aggressive’ Russia others, as challenges for US, ally security,” The Official Home Page of the United States Army (January 22, 2016), http://www.army.mil/article/161324/CSA_assesses__aggressive__Russia__others__as_challenges_for_U_S___ally_security/. Robert M. Gates, Duty: Memoirs of Secretary at War (New York: Vintage Books, 2014), 311. For a deeper examination of the emergence of cyber warfare, read Kim Zetter, Countdown to Zero Day: STUXNET and the Launch of the World’s First Digital Weapon (New York: Broadway Books, 2014). Center for Army Lessons Learned, “101st Airborne Division (Air Assault) Operation United Assistance Initial Impressions Report,” 16-05 (November 2015), http://usacac.army.mil/sites/default/files/publications/16-05.pdf. David Vergun, “Dailey: Non-deployable Soldiers No.1 problem,” The Official Home Page of the United States Army (November 19, 2015), http://www.army.mil/article/158897/Dailey__Non_deployable_Soldiers_No_1_problem/. Secretary Rumsfeld said this in response to a soldier’s question at a town hall meeting at Camp Buehring, Kuwait on December 8, 2004. It can be viewed at https://www.youtube.com/watch?v=3jPgljRvzQw. Micah Zenko, “100% Right 0% of the Time: Why the U.S. military can’t predict the next war,” Foreign Policy (October 16, 2012), http://foreignpolicy.com/2012/10/16/100-right-0-of-the-time/.